We return to Romania with renewed strength and vision. 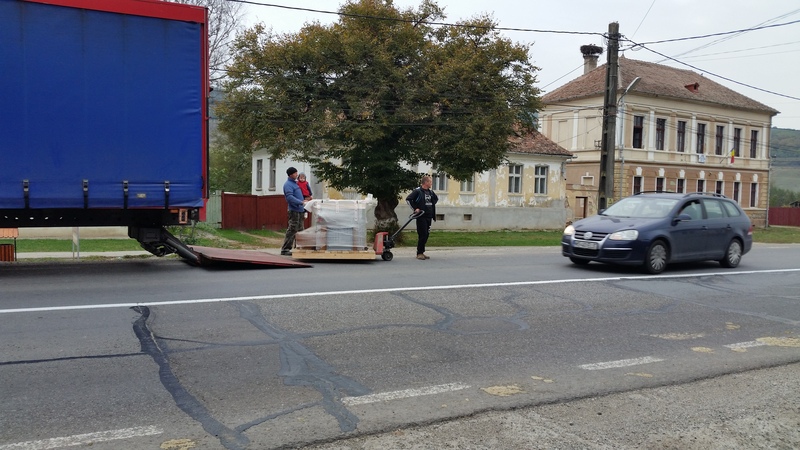 The pattern we hope to maintain is nine months in Romania and three here. Time will tell what the future holds. The summer has, for the most part been restful and invigorating. Restful in being with our granddaughter and watching her grow. Restful in that we have had many meals and coffees with friends to catch up on our lives. The summer has been invigorating in experiencing the support from folks in our church, Community Mennonite, and from our community. 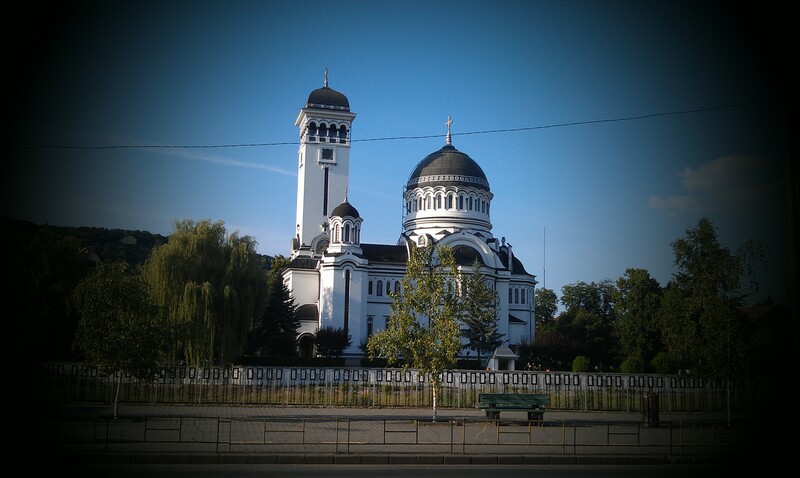 I don’t think we fully know how many prayers are being said for us when we’re in Romania. Our conversations have enabled us to reflect on the last year and dream about the coming year. As we look forward to our return we see opportunities and challenges. We think if we didn’t have those, returning would be less exciting. 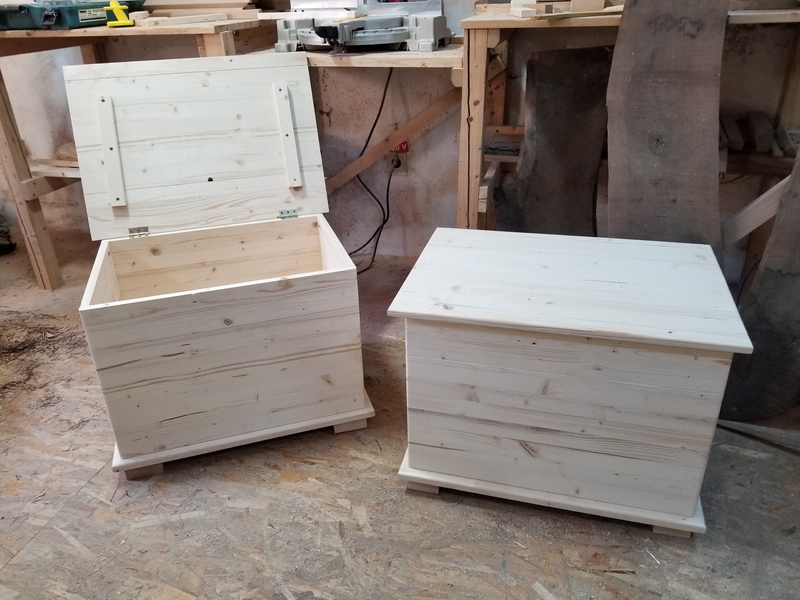 Moving into the fourth year of the woodshop, we already have orders to complete. All of our jobs have come from contacts we have and from those who have seen what we make and would like us to make something for them. We hope to begin to market our products to the wider community in the coming months. Sheri will continue to work with the Kids’ Club at the Nazarene Church in Tigmandru and give counsel to the leadership of Veritas. In addition she will work on fundraising and informing the public of the mission of Veritas. The relationships in both organizations continue to inspire and challenge her. For your enjoyment we invite you to listen to music from our August 12 fundraising event. 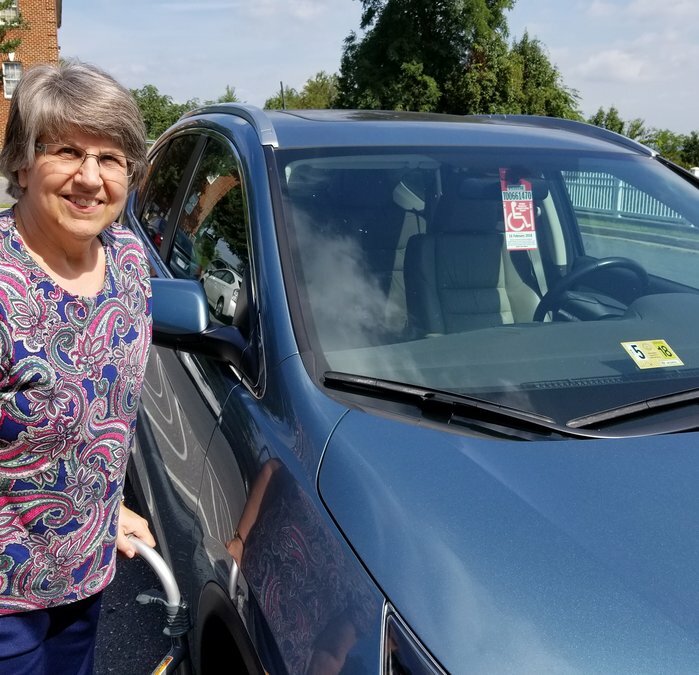 In the program for that event, we wrote: “It is fitting that a fundraiser for Hartzlers would include music from a choir which brings together singers from Eastern Mennonite High School touring choirs from 1976 through 2018. (Jay directed from 1982-2015. )” We were blessed with the participation of 50 singers and by the quality of their singing. And for me (Jay) it was a delight to direct so many of my former students once again. 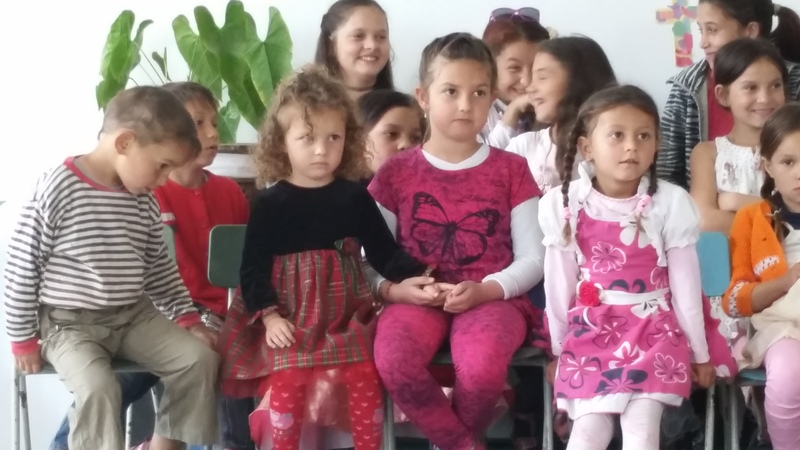 Our work in Romania has always included music. 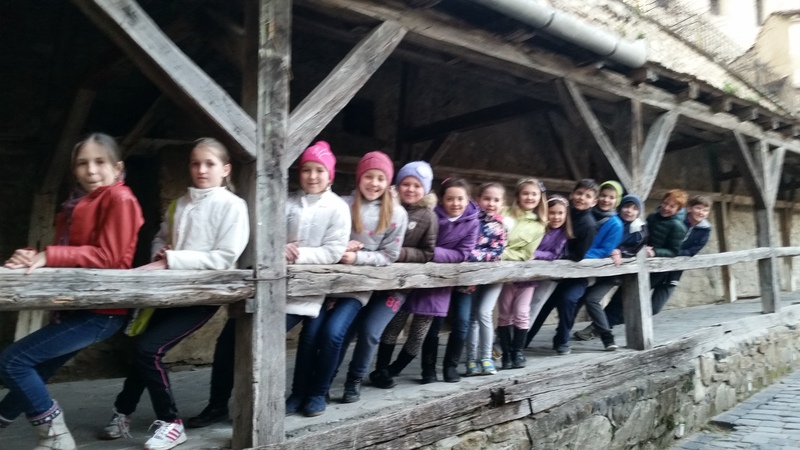 Jay continues to direct adult and children’s choirs in Sighisoara. 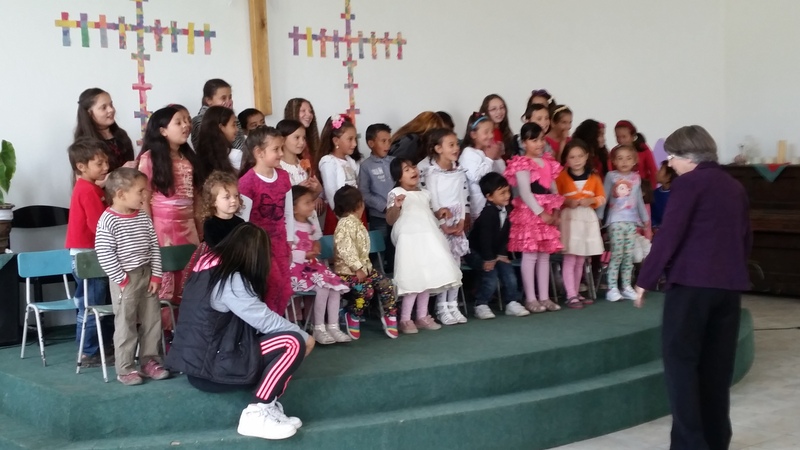 Sheri leads singing for the Kids’ Club in Tigmandru and for some of the Veritas clubs. 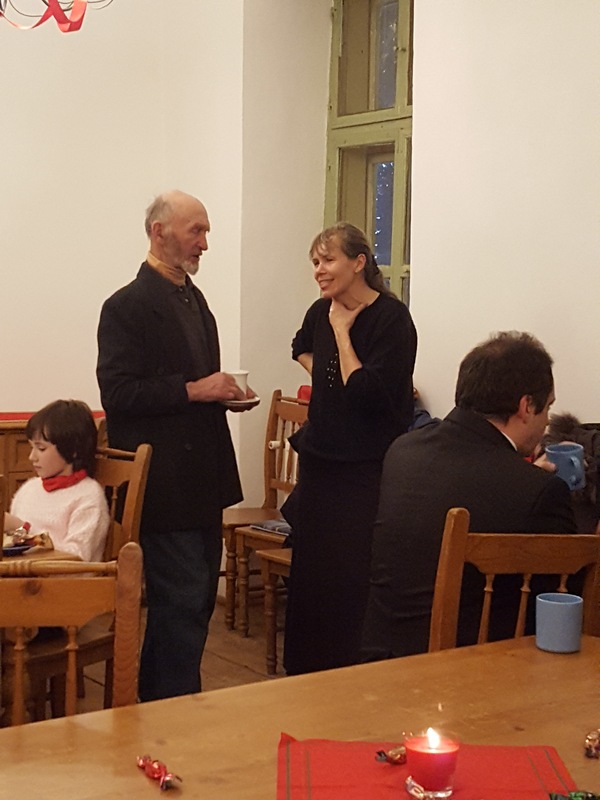 We always include singing when we give devotions for the Veritas staff and we assist with worship music at the Sighisoara and Tigmandru Nazarene churches. As we return to Romania in early September, we go with gratitude. We ask that you pray with us that the message of Christ will dwell in us during this next season of service. Here is a bit of an update on the shop. First, we thank you for your financial support. It has kept us going. The business is essentially three years old and although we are in the red without your help we are closer to breaking even than I thought we would be at this time. Most of our large purchases have been made and we are now having to replace some of the smaller electric tools that have been overworked. We now have an industrial jointer/planer that has enabled us to do some nice oak pieces, primarily two kitchens. One of the kitchens has a solid oak counter top. 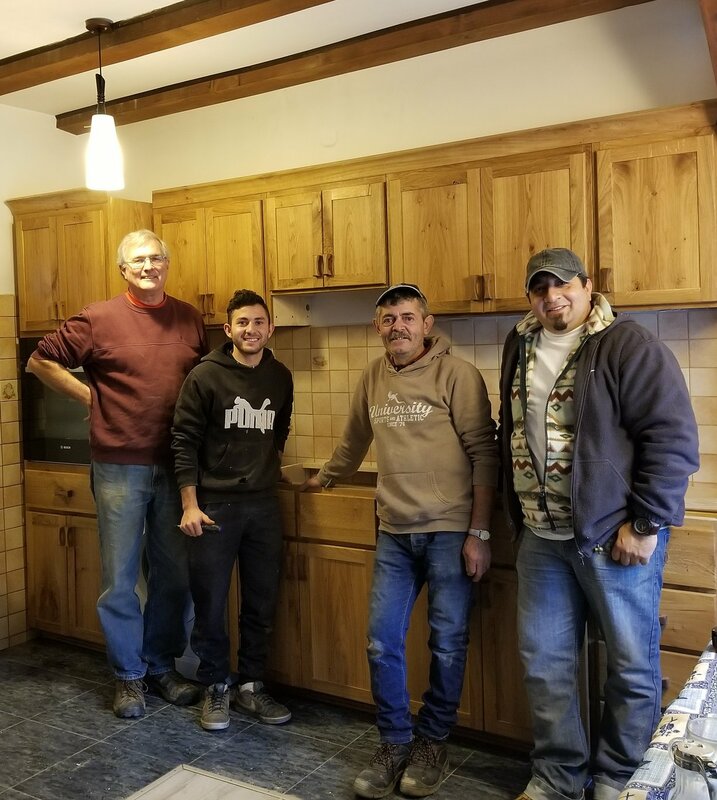 A third kitchen was finished at the end of last year. Other projects include bunk beds (8), beds/dresser combination, shelves, wood boxes for fire wood, boxes for Mark the spoonman (he carves them after we make the box), a shoe rack (everyone takes off shoes when entering a house and this piece was a cupboard for shoes), a cabinet to cover the heating pipes (all houses have heaters with exposed pipes so we made a cabinet to cover them up – and we have another to make next fall) and smaller projects. We currently have orders for a desk, outside bench, picture frames, tea boxes, more shelving and a table. The encouraging aspect of our work is that we are getting work from referrals. Folks have seen what we have done and have asked if we can make something for them … because they like what they have seen. This year we are also paying the men above minimum wage. That puts a stretch to our budget but it’s working out OK. I would still like to add workers and possibly have a morning and afternoon shift but finding workers is difficult. Even though we pay above the minimum wage they feel it isn’t enough to make it worth their time. Those who go to Germany or England or Austria make MUCH more than we could ever pay them. Because of this, we’ve had some transition in workers. Gaby went to England in February where he could earn in one week what would take him a month and a half here. I was sad to see him go but understand why. He came back in May when the situation didn’t work out. Gaby’s dad, Marin, started to work with us in February. Marin had worked for five years in a large woodshop near here. He has been a good addition to the shop and had a very short learning curve. I have been able to find sources for kiln-dried oak in recent months, one of the earlier frustrations. However, I can no longer get kiln-dried walnut. Many of the recent projects have been made out of pine. The downside of this year has been our car/truck died. We’ve used it for three years and it has hauled MANY boards. 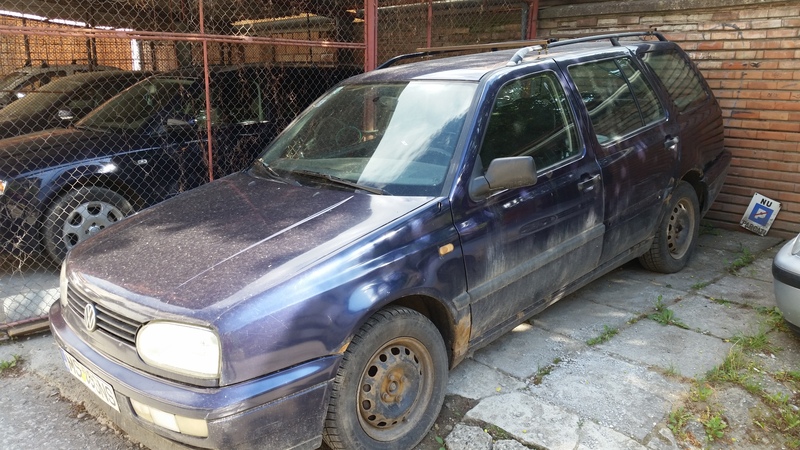 To meet inspection the ’96 VW repairs would cost 1000 Euros … the car is worth 500 Euros. In the fall we will have to replace it. We welcome your continued partnership with us in the work of the shop. It is heartening to see how much the workers have learned and it is truly a blessing that we continue to have as much work as we can do working 20 hours a week. Our tax-deductible on-line donation site (through Nazarene Compassionate Ministries) is available HERE or checks can be sent to Global Treasury Services Church of the Nazarene, P.O. Box 843116, Kansas City, MO 64184-3116 with Tigmandru Woodshop in the Memo line. 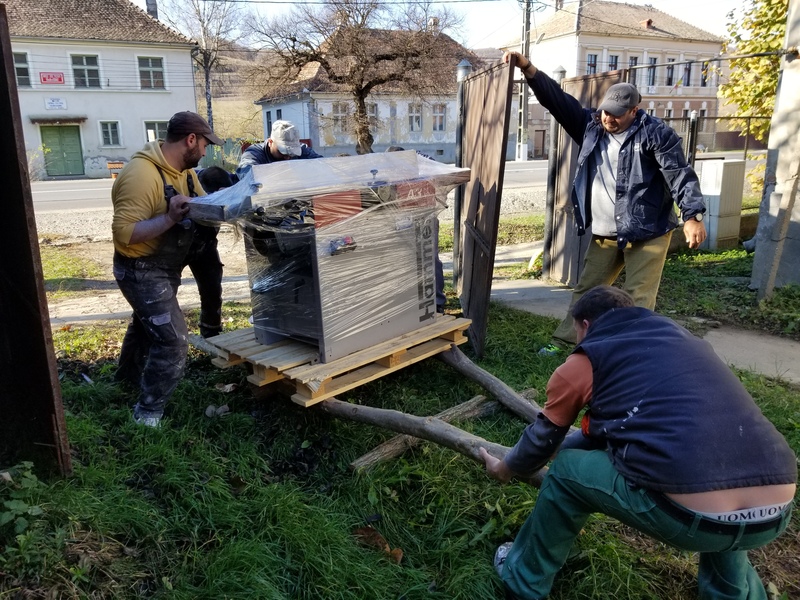 Thank you for your interest in this work and for your prayers as we look forward to a summer in the U.S and then a return to Romania in September, 2018. I’m not fully adjusted to the retired life but the change is an opportunity for new adventure and life experience. Yesterday I sat in the pew at the Church on the Hill in Sighisoara and reflected on my choirs. The sound of the choirs and my interaction with the students is what I miss. The memory of “In paradisum” which we sang in that space is still fresh. I know it’s a cliche to say but the 40 years of teaching went by so quickly that I regret that I rarely stopped to listen to life. The formal school teaching is behind but I often find myself thinking about the experience. I enjoyed my time in the classroom. I think having my boys in school heightened my joy in teaching. Rarely, if ever, did I go home thinking I should get out of this job. I often felt sorry for my colleagues who were struggling to make it from day to day. I think the joy came because in the classes or choirs we were working toward a common goal. Our goal was to make music that inspired us and our audiences, and to honor each other and work for a better understanding of who we are as children of God. 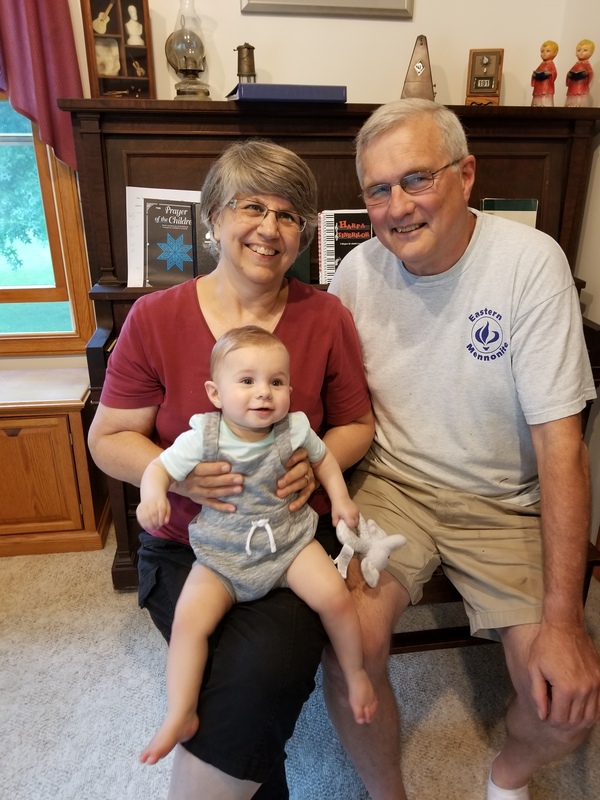 Now as I think about retirement I reflect on my past and see how my teaching connects to my present situation. The 40 years prepared me for much of what I’m doing now. I’m still teaching but with a very different perspective. I’m teaching, but it’s very clear I’m learning more than I’m teaching. Whether it be in the wood shop or with the teens or the children’s choir or the adult choir, the work I do with each group is built on the building blocks of my first 40 years. I am blessed. I have the opportunity to choose, to use the gifts I have in benefiting others, to share the love of Jesus. I’m inspired through making music, working with friends, making furniture and learning about life. A Christmas blessing to all of you! We won’t recount the experiences of the past year because many of you already know what we’ve been doing from watching our Facebook posts. Your support for us is the best Christmas gift you could imagine. We learn more and more every day how your prayers and and care for us miles and miles away is what gives us stability and the desire to keep doing what we are doing. For some reason this Christmas seems more like Christmas than some of the others we have experienced. The gifts we have received have been in the form of words … unexpected words … from people who we barely know. One such person was a member of our adult choir. He is a 76-year-old German man. He came to choir a few times last September but then returned the first of November. He speaks no Romanian so everything in rehearsal needed to be translated into German for him. During our party after the concert this week he wanted to speak. He said he’s sung all his life but was never able to sing in a “professional” group like our choir. He’s not the best singer in the choir but he has a warm heart. He said his greatest gift this Christmas was being able to sing in the choir. Sometimes we never know what the gifts are that we give to others and the gifts we receive are often ones we could never imagine. 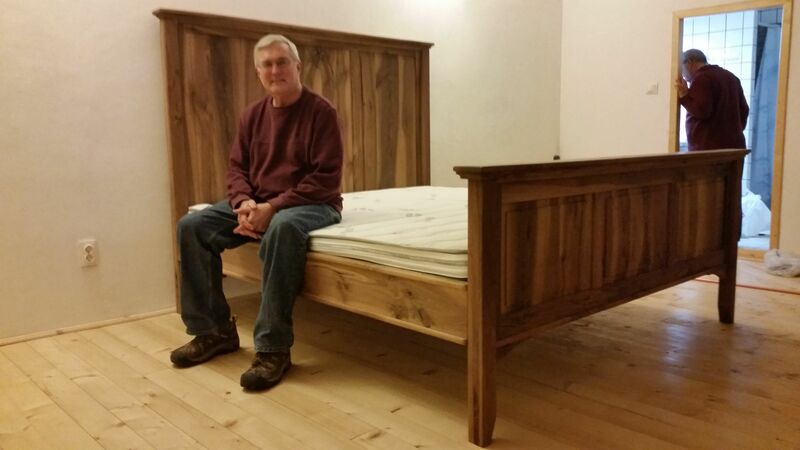 Another Christmas gift this year was from the man for whom we made a bed (in the Tigmandru Woodshop). When the final piece was delivered, I was offered a cup of tea and then a bag of gifts which included homemade zacusca (a vegetable spread which everyone here makes! ), a tiny bottle of grape polinca (firewater), and a jar of pepper jam used to flavor meat. 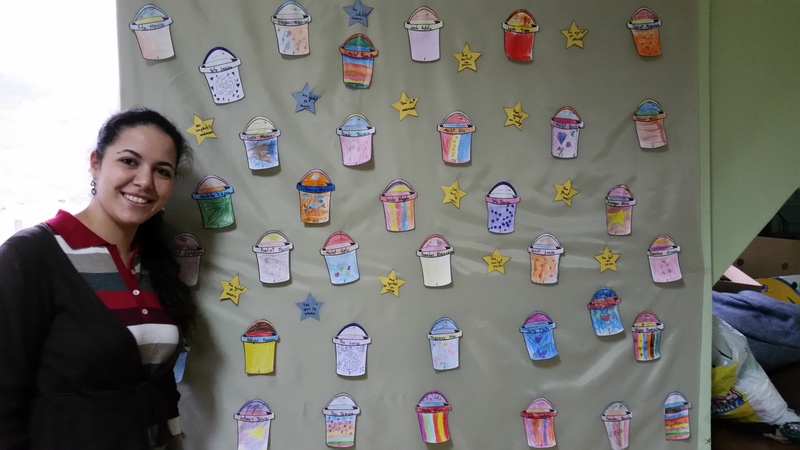 These homemade offerings (and many others we’ve received) come from the heart of the giver. We are happy to be the recipients. Our gift to you this Christmas is a sampling of the Christmas music we were a part of this Advent season. As with our experience with choirs in the past, the joy of making music together and seeing the joy in the faces of the choir members is a blessing. We continue to enjoy the rich diversity of the adult choir and the joy of singing with children in the Sighisoara choir and in Tigmandru. 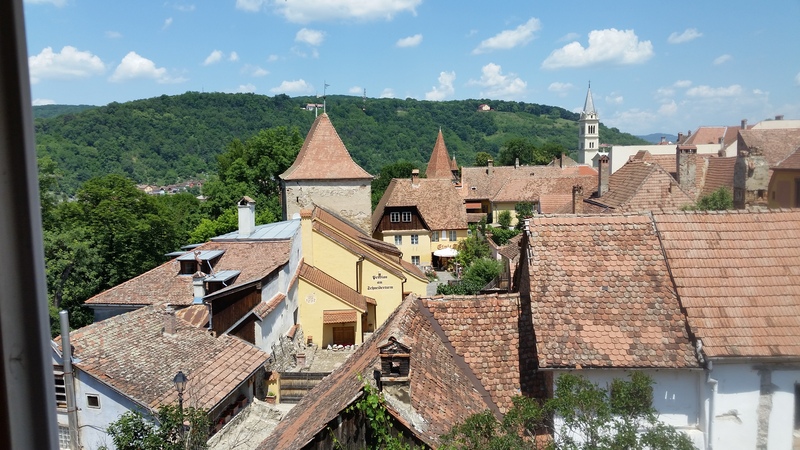 Six video clips from the Sighisoara choirs in performance on December 21 can be found on YouTube here: RomanianNotesVideos. May the gifts of love and friendship and the peace of God be yours this Christmas. May the love of Jesus fill your hearts so much that you have strength to endure whatever may arise in your life and that you can share your love of Jesus with others. There have been many “Romanian” days but this one is right up there with the best. The day started off calm enough, leaving for Tigmandru at 8:40 because the table saw was to arrive soon after 9:00. Already you know — it didn’t come then. For the next two and a half hours three-year-old Patrick who lives next door to the shop taught me the fine skill of cracking walnuts by stepping on them. He kept bringing them to me to crack. I did some work in the shop while waiting and started the fire since it was in the low 60’s. Being curious I went outside to check the smoke coming out of the chimney … it wasn’t. Smoke was coming out through the tiles and around the base of the chimney but not where it was supposed to come out. It was plugged from birds making their home there. I talked to Marius (who lives next door) using the best Romanian I had and said “fire” and he came running. Told me what was going on and that we’d clean it out tomorrow. In the meantime, 11 by now, Marius asked what was happening and I said I was waiting for the table saw to be delivered. 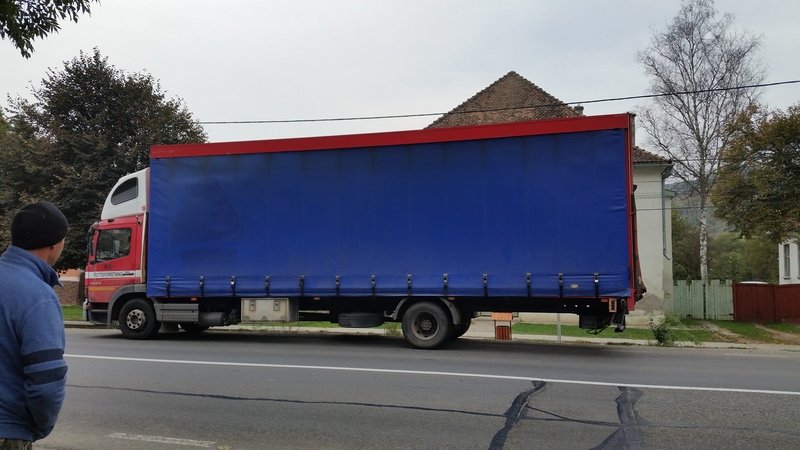 He said we should call the trucker – so we did. He was “ten minutes” away. Right, you know he didn’t arrive in ten minutes. So about 40 minutes later he stopped on the opposite s ide of the road from the shop. You need to know the road through Tigmandru is like a race track. We eventually got across the road after a police van with lights blazing and a horse cart and many cars came by. So now the saw is out behind the shop waiting for the technician to take it apart so we can get it through the door. The door is 76 cm and the saw is 76 cm. Actually, it’s 76 cm if you don’t count the rod that changes the angle of the blade … with that it’s 80 cm. You do the math. The technician is com ing at 2:00 … RIIIIIGHT. In the meantime it’s time for lunch so I walk the half mile to the store and buy a hunk of salami, cheese, bread and a Fanta. It was quite tasty. I had a little left so I fed the shop guard dogs. After lunch I went to pick up Atila at my regular time – 1 p.m. After waiting an unusually long time for him – he’s always right there when I come – I find out he’s in the hospital and pretty sick but I don’t really get the full story. I headed back to the shop and waited for Gabi. When he arrived I had him call Magda and find out the story on Atila. He is indeed sick but one story would have him back to work tomorrow and the other in 10 days. I’ll find out tomorrow. Gabi and I started working on projects and finished them just in time for the saw to arrive at 2:00. Well, the saw arrived at 4:00. The technician was also only 10 minutes away when he called and I waited in front of the shop and saw him blow right by. He thought we were on the right side of the road. He called, turned around and arrived. 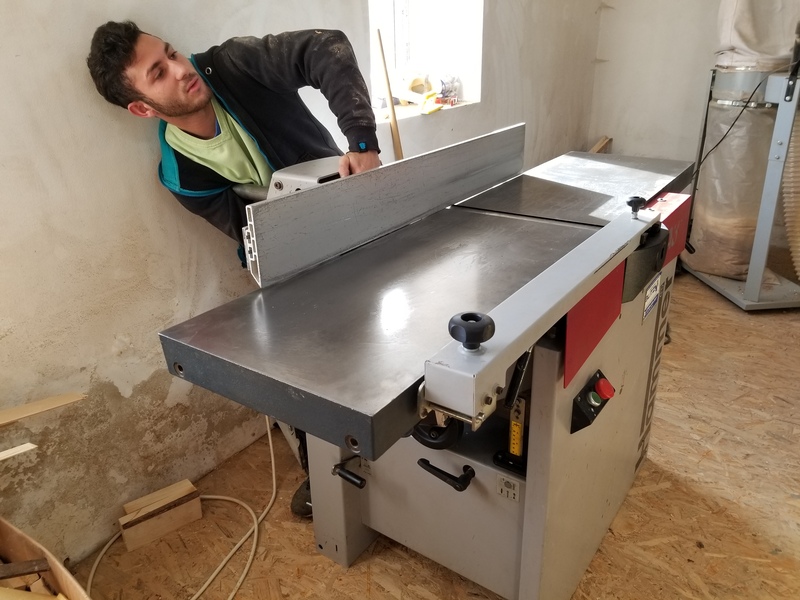 By the time he took the saw apart and we figured it could fit through the door I knew he wasn’t going to finish in time for me to be at choir at 6. Three and a half hours later the saw was installed. 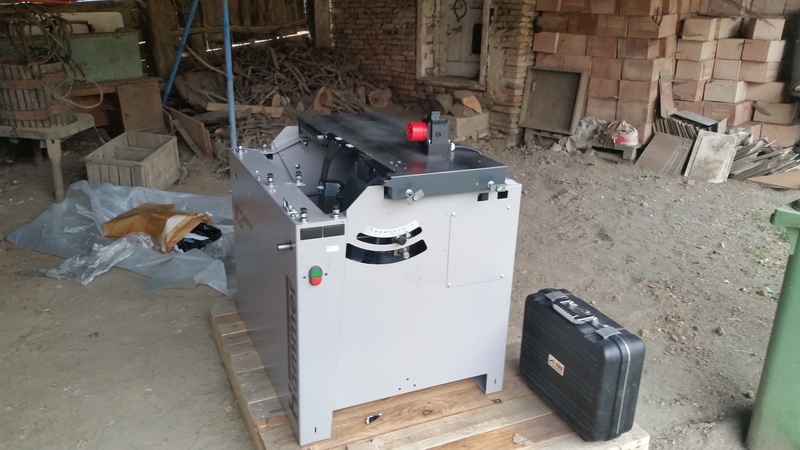 All fences adjusted, sliding table works, electric checked out and we push the green button to start the saw….and you guessed correctly, it didn’t go on. More rechecking and we discovered there is a safety on the back of the saw. We adjust the nob … NOW the saw will work … wrong. We find out that the switch has three positions. We had it at the two that kept the saw from working. Third time is a charm and we got it running! By now it’s 7:10 and I completely missed choir rehearsal. Home at 7:40 … hmm, that’s 11 hours from when I left this morning! Supper waiting … thank you Sheri. 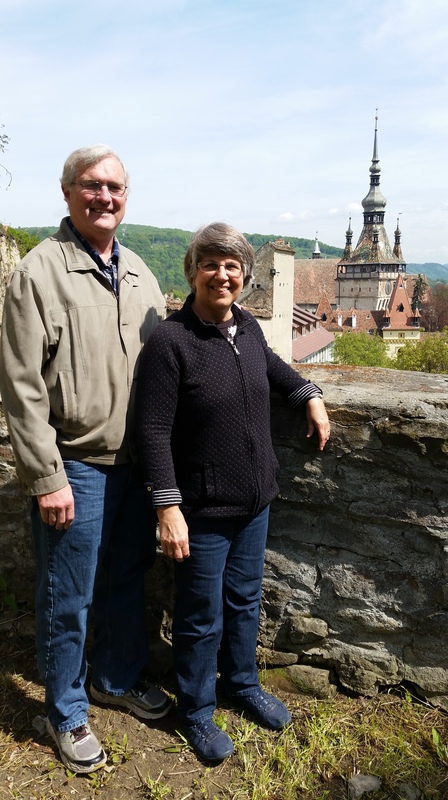 We returned to Sighisoara on September 16 and life is much the same here as it was when we left in May. My thoughts today, however, are not about our time here. This morning was the morning after the debates those of you in the U.S. observed. I’m guessing it would be impossible for any of you to not have heard a little about it. This morning I sat alone in the Church on the Hill. 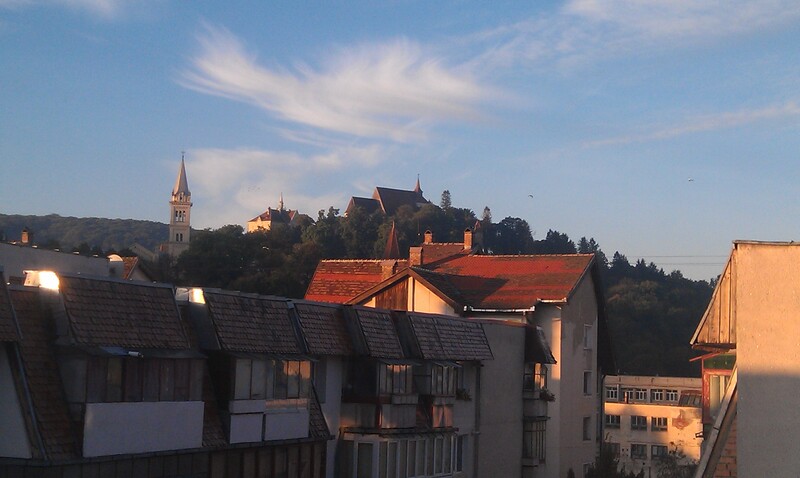 (The building at the top of the hill in this picture.) This church is my sanctuary from the chaos of everyday life. As I sat and looked at the 500-year-old building, I thought about the many souls who have passed through this building. First, the Catholics, then Lutherans worshiped in this space. Reformation, wars, communism and many more events I’m totally unaware of changed the lives of the entire community. For as awful as many of those events were, life went on. The building hosts the memory of the past. Hope … we are here because there is hope in our Creator and our Creator has us in His hands. As I think about how awful the outcome might be in this election cycle I can only hope that as we move on life will be sustained and we will not need to worry about which party rules and where the new president will take the country. The country will survive … it may take awhile to move forward, but just as this church has stood for hundreds of years, so will a people who work for good and have a better vision for what we can be. Today I’m happy that I can be here and reflect … away from the chaos of the media and politicking in the U.S. I don’t know what the result of the election will be in November but I know I can work for justice and hope where I’m at … just as all of us can, wherever we are. The Avery and Marsh song “Every Morning is Easter Morning” has taken on a new meaning this year. For most, Easter in Romania is May 1. The Orthodox calendar for Easter is often a different date than in the West. This Easter celebration was again different from any I’ve experienced. Thursday was the service of darkness that we commemorate at Community Mennonite. We talked with the folks here and described the foot washing discipline that we grew up with and that we do at CMC. They liked the idea and chose to integrate foot washing into the service. Only a few of us had experienced it, so as part of the service Sheri and Jacque (a volunteer from Murfreesboro, TN) demonstrated. The men then proceeded to the room in the back of the sanctuary and the women stayed. There were seven of us men. Here is where the Easter theme began to play in my mind. The seventh person was a man who occasionally comes to Sunday morning worship and I was surprised to see him at church on Thursday evening. Earlier in the service during the solo singing someone in the back was “singing” along. He knew the words and was connecting. It was the seventh person. As we began the foot washing he was in the first group along with Nelu. 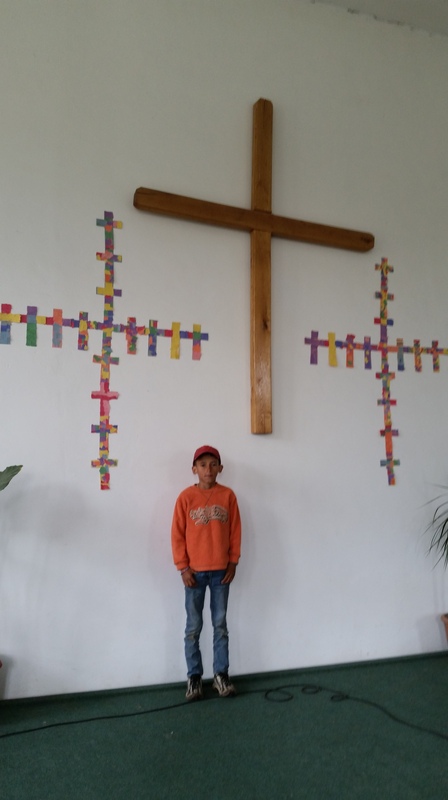 Nelu is one of the “rocks” of the congregation … firm but gentle, friendly and a great person. Foot washing was also new to him. As the visitor put his feet toward the basin Nelu took them … I’ll just say they were filthy … and washed them … really washed them. When he finished, Nelu put his feet in the water and the visitor washed … and washed … and washed Nelu’s feet. The pastor was going to tell him to stop but was encouraged not to. They did finish eventually … hugged … gave a handshake and a kiss. The symbolism of this event and the connection to Jesus made an impression that will stay in my mind. The water … dirty … smelly … used … that those of us who followed also used, made the experience more real and graphic. We had communion after the foot washing but the profound part of the evening was the foot washing. The Friday morning service in the garden outside the wall of the citadel is a traditional service for the Veritas staff where the scriptures of the last days of Jesus are read in Romanian and English. We sang, prayed and read the scripture as we looked at the crown of thorns and purple robe in the middle of the circle. It was a thoughtful time in the peace next to a 600-year-old wall that could tell many stories. On Saturday evening we attended the service at the Orthodox Cathedral. It’s interesting because the service in Harrisonburg on that evening begins at 10 and ends at midnight. This one begins at midnight and ends at 3 a.m. We didn’t really stay for the entire service … just the beginning part. Couldn’t stand for the three hours of the service. Hundreds of folks are in the plaza in front of the church and at midnight the bells begin … big bells … loud bells … first two, then three, then ending with four different tones for 15 minutes. All the while the bells are ringing the priest is chanting the resurrection story. I gues s that is what he was chanting. You really can’t hear him because the bells are too loud. After some singing and walking around, the cathedral candles are lit … one by one. People bring their candles and the flame is passed from one to another. After about 30 minutes the priest bangs on the door to symbolize death being defeated and the congregation enters the church. Those of us outside walked home with our candles lit, crossing the bridge, walking along the river. The bells rang at 1:00, 1:30, 2:00 and probably later but I was asleep. We celebrated Easter Sunday morning in our church (Sighisoara Nazarene) with singing, praying, hearing the word of God, and taking communion with other believers. The greeting “Cristos a înviat”… followed by “adevărat a înviat” could be heard starting every conversation. The very cool element of saying “Christ is risen” “Christ is risen indeed” here in Romania – and maybe other places but I can’t speak to that – is that they say it for the next 40 days … even in the grocery store. I think that defines how we look at Easter. How we look at Easter defines how we look at life … how we look at each other… how we experience Jesus. 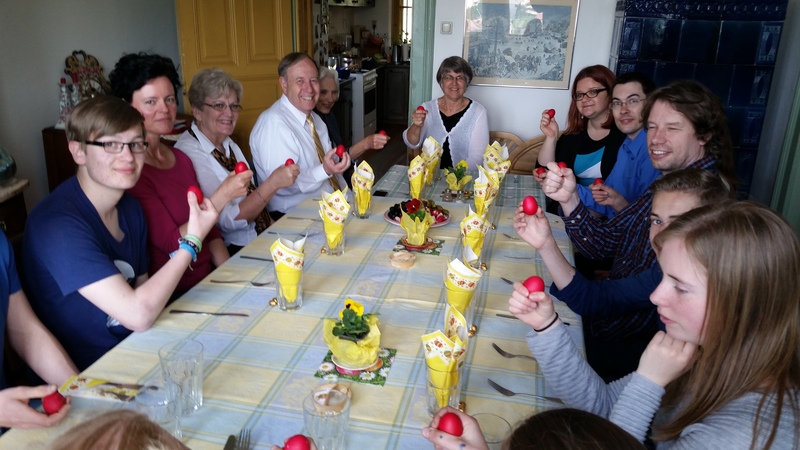 We concluded our Easter activities with dinner at the home of Roberta Bustin. Our meal began with the traditional cracking of red-dyed eggs as we repeated, “Cristos a înviat” with the response “adevărat a înviat”. The 16 guests included a team from Holland, a volunteer from Germany, an American visitor now living in East Berlin, and four other Americans. Sharing the joy of Easter around the dinner table with this diverse group of Christians was a fitting ending to our weekend. We come to Jesus as the seventh person … we come to Jesus as a child … we come to Jesus with burdens we want to hold close … we come from all nations, from all economic settings. Jesus has risen that we may have acceptance, hope, freedom and forgiveness. Every morning is Easter morning! Cristos a înviat! 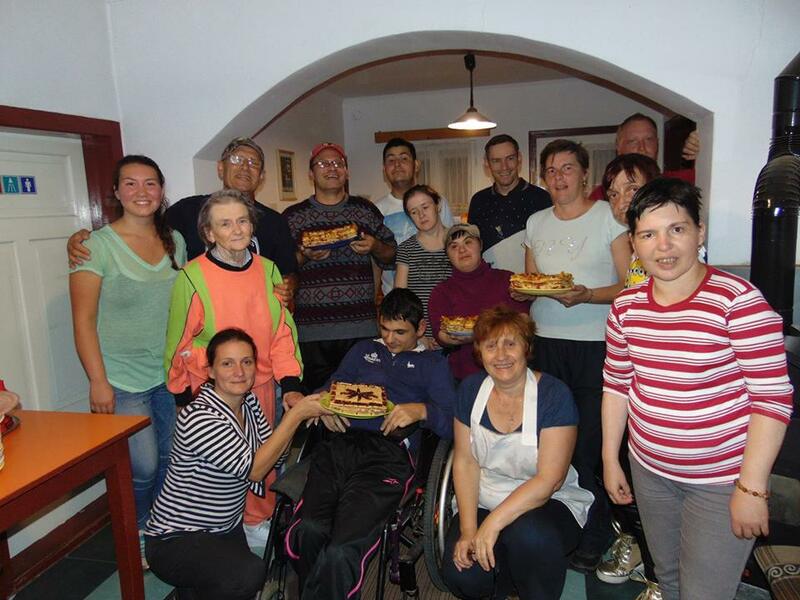 During our year-long sojourn in Romania, August 2013 – July 2014 we posted a lot of blogs. Everything was new and exciting and we wanted to share all that we were experiencing with our friends at home. 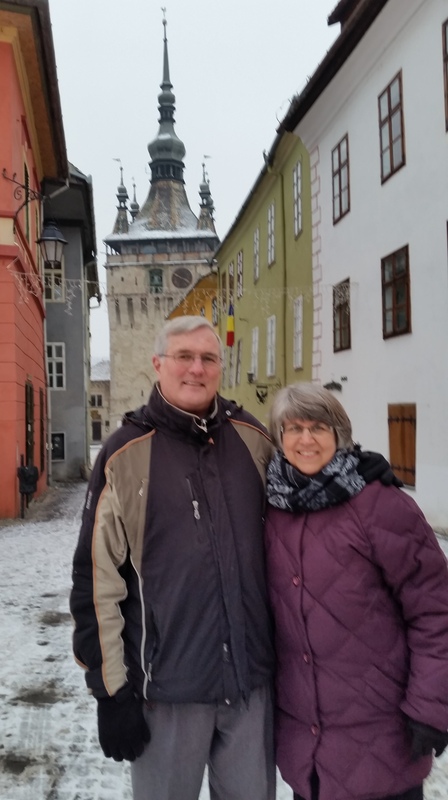 Now we find ourselves back in Sighisoara for our second four-month stay since that first year; and we have settled into the routines of life here. We still enjoy the view of the citadel, the old buildings, tile roofs, listening to the church bells ringing, our daily walks to wherever we need to go. But they are part of the everyday for us; it feels normal, ordinary, like we belong here. 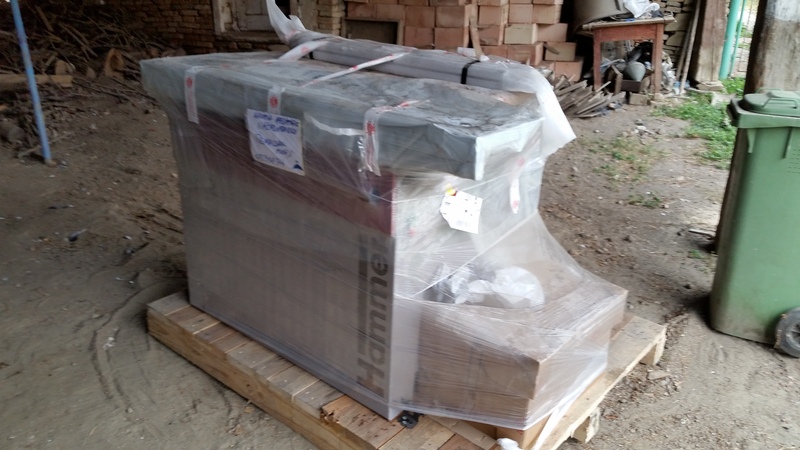 Of course we’re still working at learning the Romanian language, but that will never end! We see people on the street that we know almost every time we walk through town. We know where things are in the grocery store, and Jay knows every store in town that carries woodworking supplies (or doesn’t). Speaking of woodworking, it’s time for an update. 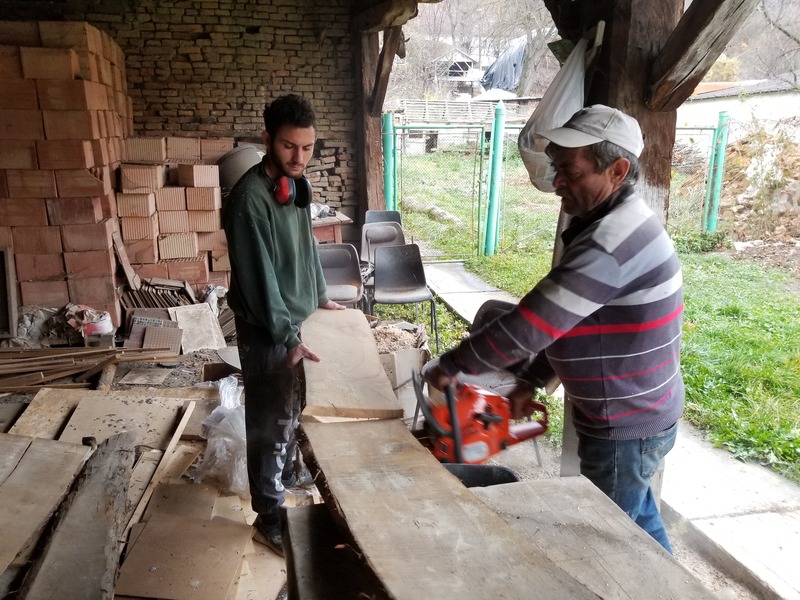 The Tâmplăria Tigmandru (Tigmandru woodshop) has been active again since Jan. 14 when we arrived this year. Jay and three men in the Tigmandru village work every afternoon from 1-5 p.m. We have just posted a Facebook page HERE. 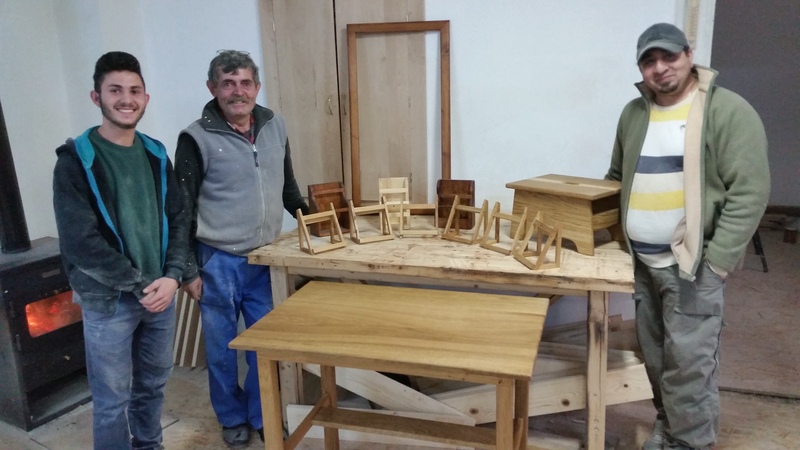 The Facebook page is in Romanian, so most of you won’t be able to read it, but you can look at the pictures of the things that have been made. We’ve been promoting this Facebook page here in Romania, as that is where we will hopefully continue to get orders. Since we put up the page we’ve already had two requests for pricing for projects. 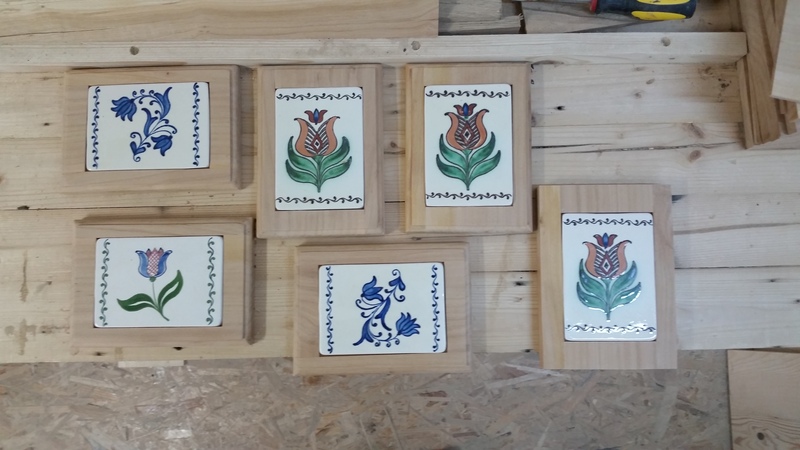 One of the current projects is making small trivets out of cherry wood with an inset of a tile designed by 20th century Anabaptists and made in the village of Corund. The interesting related story to the tiles is that historically the design is similar to Saxon and Hungarian art of the 15th c. We showed the tiles to a Saxon and he immediately said, “Saxon art”. We did the same to a Romanian and he said, “Hungarian art”. Anabaptists were in this area 500 years ago and were noted for their pottery. We are making these for the store of Mark the Spoonman and are also selling them in the House on the Rock International Café. Sheri finds joy in her work in Tigmandru with the kids’ club two afternoons a week. 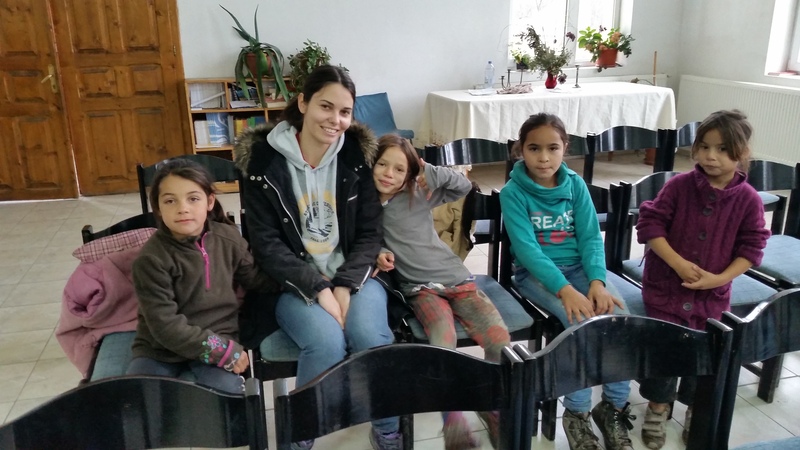 She works with Roxana (a young woman who leads the work of the club) to plan craft activities and they also spend time together in language learning – both English and Romanian. Sheri is always trying to find new Romanian children’s songs to sing with the children, which is part of the kids’ club each time they meet. She is happy to be working with Diana (talented teen who plays guitar) since Jay is no longer available during the time the club meets. The best part of kids’ club of course are the children and now that communicating with them is a bit easier, it’s a lot of fun. Sheri is also spending time each week working with staff at the Veritas Family Center. One day’s work involved making 90 muffins for a Mother’s Day event (March 8 here in Romania); another day was spent as the receptionist; a couple of days were spent in leadership team meetings (in Romanian), but most days involve computer work, updating the Veritas website, and working at fundraising activities. We are spending two evenings a week with choirs and also sing (and play) with the worship team at Sighisoara Nazarene Church on Sundays. 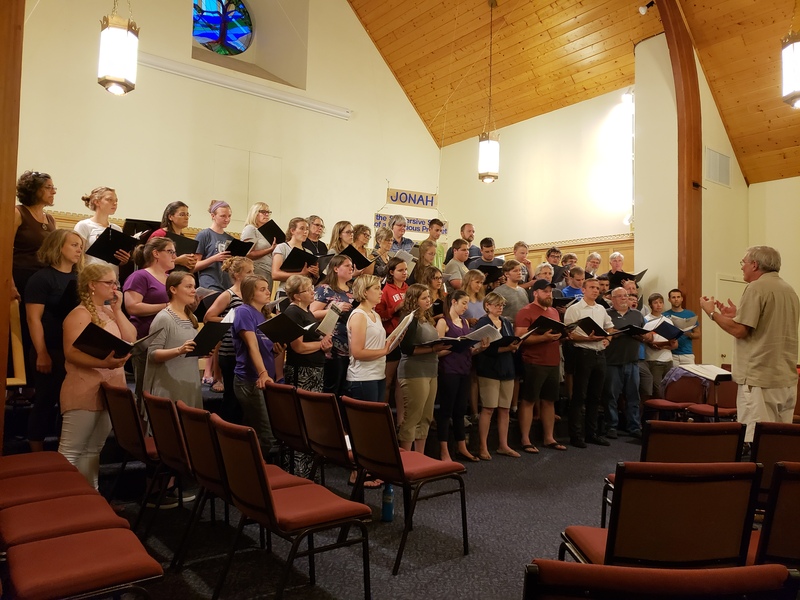 Monday night’s adult choir of 20 is singing works by Mozart, Mendelssohn, and Telemann. After the start with one male singer, we now have a balanced group. A concert will be given on May 8 which will also include the children’s choir. This choir of 17 meets on Wed. nights. The children are ages 8-12 and were auditioned to get into the group. The main criteria was being able to match pitches! The children are singing Romanian, English, Hebrew and Swahili songs. Our lives are rich with friendships and activities that make up our days. So even though we haven’t been very faithful in posting to this blog site, we haven’t forgotten you, our friends and family. We continue to be grateful for technology that allows us to stay connected through Facebook chat, email, and Magic Jack phone calls. And we are grateful that we know God is with us through the ordinary everyday activities as well as in the challenging moments when we realize, once again, that we are foreigners, and always will be, even though we also feel at home. We look forward to sharing with many of you in person during June, July and August when we’ll back in the U.S. In the meantime, please continue to keep us in your prayers. P.S. We continue to welcome contributions to the woodshop. Money is being used to pay salaries to the workers until the shop becomes self-sustaining. Your gift is tax deductible and you can give online HERE.